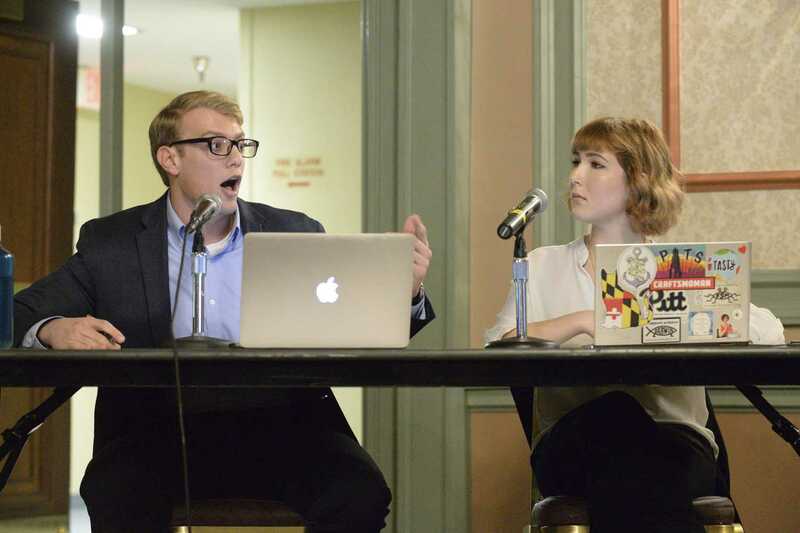 The Pitt Progressives and the Students for Liberty met Wednesday night in the William Pitt Union Kurtzman Room to debate their views on the government and distribution of wealth. The Bully PulPitt and Pitt Political Science Student Association hosted “Government and the Redistribution of Wealth” debate, and Josh Feder, a sophomore political science and communication major and member of Bully PulPitt, moderated it. The debate was followed by a question-and-answer session with Scott Smith, a history professor at Pitt. “Does the government have a responsibility to redistribute its wealth among its citizens? Should it play a role in this at all?” Feder said to start the debate. Each side had two debaters. Becca Tasker, a junior anthropology major, and Paul Cox, a sophomore mechanical engineering major, represented the Pitt Progressives. Students for Liberty presented Katherine Ranck, a sophomore actuarial math major, and Kyle Guinness, a sophomore finance and marketing major. Ben Sheppard, the president of Students for Liberty, said the debate was “excellent” and was one of the more “intense” he has attended. Ranck and Guinness spoke of their support for private charities — Light of Life Rescue Mission and American Red Cross — and free markets, while Tasker and Cox advocated for government redistribution of wealth. During the cross examination carried out by Students for Liberty, Tasker said private charities do not work because they cannot provide housing subsidies, food ballots or universal income. In the Pitt Progressives’ cross examination, they brought up the opioid crisis. The group asked how a free market can be beneficial if capitalism, as Tasker said, caused the opioid crisis because of a want of profits by companies. Guinness said the pharmaceutical market, in fact, isn’t free. “Companies are allowed to patent drugs, essentially giving them a monopoly on providing these drugs. They don’t have to answer to the people because … there is no one to hold the accountable,” Guinness said. When the debate arrived to the moderator question segment, Feder asked about the solution to wealth inequality and the balance between redistributing wealth completely and leaving the current system how it is. Tasker said there needs to be an universal basic income and medicare for all. “But I think that if we have a wage where people can do more than just survive, that would be awesome,” Tasker said. Ranck responded by saying Students for Liberty believes in living wages as well. But, Ranck said this will occur with free market and private charities. “It came across really, really abrasive. I guess in the sense I was saying, ‘I hate the poor and I don’t care about housing. I want people to freeze on the streets.’ It really didn’t come across as an answer as far as I could tell,” Lundstrom said. Tasker responded to his inquiry by saying it is not a question of how much wealth a person is entitled to, but how much life. She also said it is a question of how to stop people from starvation, homelessness and an inadequate healthcare industry. “I don’t care how much wealth people have. I care about real humans lives and if you don’t, that’s cool, but I think you should really question that,” Tasker said. Though there was some intense back-and-forth in the debate, Sheppard said it was a good showing for both political groups. Ben Sheppard is a columnist for The Pitt News.